A story from Saskatchewan. Friendly faces at the head table. Some introductions. Sources of perspective. Heady times for the province of Saskatchewan. An exciting time to be premier. Having the best job in Canada. The speaker’s desire to increase familiarity with Saskatchewan and the opportunities that exist there. Why that is good for the province but even more for the country. The chance to make a difference. Saskatchewan as the “next-year” country and how that has been so. The speaker’s message today to say that the next year has arrived. Some evidence for that. Some specifics with regard to economic, social, and demographic growth. Ways in which Saskatchewan is now a “have” province. Characteristics of the government in the province of Saskatchewan. Sustaining the economic momentum. A growth plan for Saskatchewan – some of the highlights. De-politicizing economic development. Fiscal probity. Infrastructure investment. Revamped labour legislation. Representing Saskatchewan in the United States. A story about branding. An innovation agenda. Some agricultural statistics. Having the resources. Leading the world in carbon capture and storage. Enhancing oil recovery. Continued investment in the Petroleum Research Centre at the University of Regina. Opportunities around the next generation of nuclear technology. The kind of vision needed in North America and Canada today. What will be needed to succeed. Where Saskatchewan is going to go. Seeking an eco-system of innovation through the right tax policies. The world’s desire to have cleaner energy. The vision in Saskatchewan. Helen Reeves: Chief Communications Officer, MTS Allstream Inc.
Doug Turnbull: Deputy Chairman, TD Securities. The province of Saskatchewan gets its name from an old Cree word for the Saskatchewan River and literally translates as “swift flowing river,” so perhaps it’s fitting that its newest premier and head of the Saskatchewan Party hails from Swift Current. Brad Wall was first elected to the legislature as the MLA for Swift Current in 1999. He was re-elected in 2003, became Leader of the Saskatchewan Party in March of 2004, and was elected Premier of Saskatchewan in November 2007. He has been involved in politics for much of his adult life. 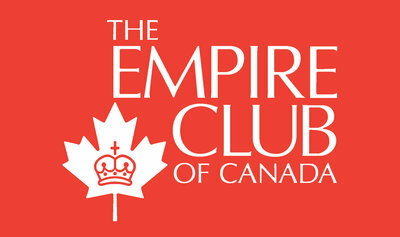 The Empire Club has a long history of hosting the premiers of Saskatchewan. And when you think of Saskatchewan the first image you evoke is probably a wide expanse of prairie with golden wheat gently blowing in the breeze. The grain farms of Saskatchewan have been feeding the people of Canada and the world since their settlement in the nineteenth century. But that picture is too narrow. Saskatchewan is now known as the POW province—Potash, Oil and Wheat. It is again a “have province” and indeed is now recruiting labour from other provinces. The times have certainly changed from when Premier Romanow spoke here in February 2000—reaching out to get prairie grain farmers through a cash crisis. Saskatchewan also has a certain tradition of inspiring speakers, perhaps due to a tradition of coming to politics and public life from the pulpit—Tommy Douglas and Lorne Calvert—although I’m sure that no one would confuse the Hon. John Diefenbaker with a preacher; he was a criminal defence lawyer by profession. Tommy Douglas, voted by CBC viewers as the “Greatest Canadian,” used to say, “I was a printer and then I became a preacher. Then I became a politician and then I became a premier. And that is the true descent of man.” On Friday, Premier Wall addressed the 2008 Global Business Forum, the first time ever for a premier of Saskatchewan, in a critical discussion of the new economy. It was held in Banff, Alberta, and perhaps it felt like a bit of a passing of the torch from Alberta to a new provincial powerhouse. Premier Wall and his wife Tami continue to make their home in Swift Current. They have three children, Megan, Colter and Faith. Please join me in welcoming the Honourable Brad Wall. Thank you very much Jo-Ann for the introduction and to all of you for being here to provide this opportunity for me and Lyle and Rob and others who have joined me from Saskatchewan to tell our story. It is pretty easy to get a sense of home in this room especially with some friendly faces at the head table here. I had the great honour of working with Peter Varley back in Saskatchewan years ago. If there are people back in Saskatchewan who are regretting electing a new government led by myself, they owe some of the blame at least to John Weir, who actually took a chance and hired me back to Saskatchewan when I was living in Ottawa. John, it’s great to see you and Margot here. Lisa Baiton and I grew up together in Swift Current. We attended Sunday School, elementary school and high school together. We were involved in provincial politics there and Lisa it is very nice to see you here today. There are a lot of sources of perspective here for me this afternoon and that’s important, because these are heady times for the province of Saskatchewan. It’s a very exciting time to be the premier. I really feel that I’ve got the best job in Canada. I’m very, very fortunate to be in the position that I’m in. Our ministers would agree that we have this great opportunity in Saskatchewan and we need to keep the momentum going so we are always looking for perspective. I seek today on behalf of our province and the people of Saskatchewan to increase your familiarity with Saskatchewan’s story and the opportunities that exist and tell you why that’s not just good for the province but very, very good for the country. Every now and then there does come an opportunity in whatever our location or vocation may be to make a difference. Every now and then there is an opportunity to make a little bit of history, to make some positive history. The moments are rare; they come unheralded. For as long as I can remember, Saskatchewan has been “next-year” country. It’s been that way in too much of the economy. It’s been that way in agriculture. Lyle tells me his crop is looking pretty good; it’s almost off now. It’s been next-year country in football for far too long. Well, part of my message here today is to very modestly and respectfully tell you that in my province next year has arrived. And the evidence, anecdotal and empirical and footnoted, is compelling. For example, most of the chartered banks continue to say that Saskatchewan will lead the nation in economic growth this year. Some are forecasting already that it will continue into next year. The Canadian Federation of Independent Business has again released the survey of its members. Businesswomen and men across the country say that Saskatchewan is leading the country. Two weeks ago news arrived that our province is leading the nation in percentage increase in international export—69 per cent. Our population is growing at the highest rate in 50 years. We lead the nation in terms of growth in retail sales. That is an indication, an ongoing indication, notwithstanding what’s happening in the economy today, of the consumer confidence that exists in our province. Saskatchewan is now the only province in the top-10 jurisdictions according to a survey of petroleum executives released by the Fraser Institute. The report ranks Saskatchewan as the sixth most favourable jurisdiction of 81 jurisdictions worldwide for petroleum investments. I wanted to add here that while Saskatchewan is ranked number six on that list, Alberta is number 29. The report described Saskatchewan as a model of stability and the jewel of Canada’s oil-and-gas segment. There was, in terms of anecdotal evidence, a recent article in the Globe and Mail, which I understand is a newspaper here in Toronto. I have an editorial board meeting this afternoon. I think I might pay for that remark. The Globe and Mail pointed out that Saskatchewan had got its groove back. I was unaware that we had lost our groove but we are grateful for that kind of recognition. There is a long list of empirical facts that would support the thesis that Saskatchewan is leading today, and has a real chance to sustain that momentum over the midterm and the longer term and continue to lead. That’s obviously positive, but the most positive thing about that is that Saskatchewan today is a “have” province. There is a government in the province of Saskatchewan with the vision and determination to ensure that we continue as a have province. And let me just say in front of this group today that our province is very, very grateful for that fact. Because of our nation, because of fiscal federalism, we have had the support and the help and the assistance of other parts of the country when we were not a have province. You need to know that part of our vision, part of our exhilaration about our new status as a have province and our determination to stay that way, is so that we can pay back a little bit. So that we can contribute more to the country and in the future of this country than we ever need to get in return. It is a strength of Canada that when regions prosper there is a benefit to the entire country, and we are very, very grateful for the help in the past and we are very, very committed to providing that help in the future. We’ve worked very hard on a growth plan for Saskatchewan so as not to screw things up. To continue the economic momentum we will begin implementing it. Let me share some of the highlights of that plan with you today. First and foremost, we wanted to de-politicize economic development in the province. For too long under parties of different stripes—this is not a partisan statement, mind you—we have relied on an economic plan that picked winners and losers. A plan that used taxpayers as involuntary venture capitalists. The net result has been projects that have failed. Whether they have been potato businesses or dot-coms or movie businesses, the economy has under-performed. We want to take the politics out of economic development. We have a new partnership. It’s called Enterprise Saskatchewan and it is constituted with all the stakeholders in our economy. Its job is to publicly hold our government accountable for how competitive our economy is and what the government is doing to ensure its competitiveness. The second element of our growth plan is fiscal probity. We have inherited a bit of a debt. There is some debt in the province. The previous government made some modest progress on the issue. We passed, as one of our first pieces of legislation, something called the Growth and Financial Security Act. It prescribed that our government would, with unbudgeted surpluses, apply by law half of those surpluses to debt, the other half to infrastructure. Because of that decision and the decision to actually exceed that requirement on the debt, I can report to you today with pride, as we have to the people of the province, that in our first year of government we will have cut the debt of the province of Saskatchewan by a third. And you can expect to see more progress in this regard before the year is out. Fiscal probity is absolutely foundational to our growth plan. So are lower taxes for our economy, and we are going to continue to put downward pressure on taxes and on those barriers to growth. Sometimes our efforts with respect to taxes will mean not decreases but simply the status quo. About a month after our government was sworn in, we went to Calgary to give a speech at the Petroleum Club, where I announced that Saskatchewan would not be increasing its oil royalties. It’s the first and probably the only time that I have ever received an ovation for our government doing precisely nothing at all. Infrastructure investment is key. We have heard from our friends in Alberta. We’ve tried to learn from their successes and their challenges that you have to balance debt reduction with investment and infrastructure to avoid some of the challenges of growth. That’s very much part of our plan. We have revamped our labour legislation under the direction and guidance of the minister who has joined us here today—the Honourable Rob Norris—to rebalance our labour legislation so that it would be fair to both sides, would not be a dis-incentive to employers to operate in the province and create jobs, and would be competitive with other jurisdictions in Canada. Part of our growth plan is to make sure we tell our story. That’s why I’m here today. We are attending a job fair in Toronto—Canada’s biggest job fair. Fifty companies from Saskatchewan have joined us. We are going to get our message out. We’ve been in Washington and in New York. We have a story to tell our American friends. They are unaware, for example, that 6 per cent of their electricity comes from uranium in our province and that we sell them more oil than the nation of Kuwait. This is a positive message on a continent that, I think, is looking for some constructive trade dialogue. We can contribute to it and we intend to. We intend to also get our message out around the country. We have to make sure that this new reality, this new brand, is well known. I remember that not very long ago, I was driving our youngest daughter to a birthday party, and it got me thinking about branding methods. She said, “Dad I’ve got something to tell you,” and that’s always important so I turned down the radio and said, “What’s that?” She said, “Dad I just want you to know that I’ve been thinking and I’ve decided that my favourite Coke is Pepsi.” That kind of gets you thinking about branding doesn’t it? Coke would be pretty happy; it got the whole segment. Pepsi would be thrilled; it got her vote in that branding segment. We have to have a brand in our province that we are welcoming of investment, of business. But we also have quality of life; that’s a priority in our province as well. Ultimately, we are also seeking new partnerships within western Canada and with other provinces so that we can co-operate on a bilateral basis with Alberta and other jurisdictions to further reduce inter-provincial trade barriers and make Saskatchewan a great place to do business. Finally, the most important element of our growth plan is our innovation agenda for our economy and I’m going to spend a little bit of time on this if I can. I think people in this room will know that we are a resource powerhouse; we have always been a resource powerhouse. Roughly a third of the potash supply in the world is in our province. Twenty-six percent or so of uranium production last year came from Saskatchewan. We’re the second-largest producer of oil in the Dominion of Canada and the third-largest producer of natural gas. We have a third of the country’s Ag. biotech community at the University of Saskatchewan. And in terms of agriculture—and we don’t talk about this enough and we ought to especially today when the world sees more and more of a growing middle class as hungry and hungrier and hungrier and using more intense agricultural practices to grow food and also be able to purchase the food that they need—we need to consider the following. Saskatchewan includes half of the arable acres in the country. Forty-five percent of the nation’s canola production comes from our province. Thirty-two percent of the world’s lentil exports are from Saskatchewan. A quarter of the world’s flaxseed is from Saskatchewan. A quarter of the world’s mustard production is from Saskatchewan. Thirty-eight per cent of the world’s dried pea export is from the province of Saskatchewan. This is very, very significant when you think about the future. We know we have the resources. That’s our right hook in terms of our economic one-two punch. What we need to do is work on our jab—if I can use that clumsy sports metaphor. And for us the jab is the innovation economy. In western Canada, and significantly in the province of Saskatchewan, we did miss out—for the most part—on that manufacturing sector. And now we see that sector under some considerable stress right across the western economies of the world. We have the opportunity in the province to build on some momentum already on the innovation economy to make that our one-two punch. To make that our legacy. To smooth out the bumps of a commodity-based economy, a resource-based economy. Consider with me the advantages that we already have. We do have Canada’s only synchrotron at the University of Saskatchewan. You will see our government doing more with industry and the university itself to take fuller advantage and better advantage of that huge and important asset to our province. We do have a third of Canada’s Ag. biotech community, as I’ve already mentioned. We lead the world in carbon capture and storage and we’re using it to enhance oil recovery. That project in Weyburn, Saskatchewan, together with EnCana and Apache Oil will have sequestered 30 million tonnes of carbon dioxide. We are not shifting it around, not putting a price on it, but putting it in the ground. We are in the third phase of that research project and it’s demonstrated to be stable and staying right where we want it to stay. We are going to continue to invest in that through the Petroleum Research Centre at the University of Regina. I can tell you that we are going to carve out our leadership position on clean coal. We have signaled our government’s preparedness to invest about $1.4 billion in a project in south-east Saskatchewan on clean coal. We are going to co-ordinate with Alberta because they are looking at a few projects as well. We know there is a risk, but the importance of the work cannot be overstated. We are going to work aggressively in the area of adding value to the uranium that we have in our province in biblical proportions. The next ounce of yellow cake that we add any value to at all before it leaves Saskatchewan will be the first. I think that needs to change. We want to look at the opportunities for refinement and for conversion and for upgrading. We want to look at the opportunities around the federal government’s stated intent to find that next generation of nuclear technology. We want to work with what exists in the country already through Atomic Energy of Canada Limited and think a little bit outside the box, about what’s possible. We are going to be there with an investment from our province to try and build a carbon niche with respect to uranium value-added opportunities. We seek to place Saskatchewan at the middle of this action around innovation. One of my favourite authors is Thomas Friedman. Probably most people in this room have read his first two books. Maybe you’ve also already read “Hot, Flat and Crowded.” He was interviewed by Time Magazine in advance of the release of his latest book and asked this question: “What is your favourite renewable fuel?” Here is what he said. “You know what my favourite renewable fuel is? An eco-system of innovation. That’s really what’s missing today. A hundred thousand people out there trying a hundred thousand different things in a hundred thousand different garages. Who knows what would come of that?” I echo that rhetorical question. Who knows what can come of a concerted and continental effort with respect to innovation, especially in the area of environment and energy? The confluence of those two issues presents us a challenge certainly, but also a huge, huge opportunity and I want Saskatchewan to be right in the middle of it. I was at the Western Governor’s Association meeting in July and before the meeting I was at the National Laboratory in Idaho. There they had this interesting map of all the energy sources, renewable and non-renewable, along the west side of our continent and also of all the jurisdictions—the states and the provinces—that are looking at innovation around energy and the environment. It is amazing what is going on, sometimes too separately and too viscerally. It is amazing what is going on today, if not in a co-operative way. I think that Freidman is asking those questions. What is possible with respect to renewables—solar and wind and biomass? What is possible with respect to cleaning up fossil fuels? Is there an application for nuclear power to the oil sands? What about fusion? What about cellulosic ethanol? The United States government has signaled that it would like to see, at least Secretary Bodman has signaled that he would like to see, a cellulosic ethanol competitive with gasoline in five years. What is possible? To some, some of these things seem eye-rollingly crazy, I’m sure. Probably, that is exactly how the man-to-the-moon mission speech sounded to the joint session of Congress in 1961. It might have sounded like someone was trying to change the channel after the Bay of Pigs, I don’t know. But we understood the impact of that speech with a timeline and an objective. It marshaled the forces of that country to achieve an objective. That’s the kind of vision we need in North America today. That’s the kind of vision we need here in Canada. There is a huge opportunity around environment and energy, but what we are going to need to succeed is a dynamic partnership of industry, of government, provinces and states and our national government and academia. That will be our focus in Saskatchewan. We are going to move aggressively to find those technological answers, and, by the way, that’s why we are not as interested as some in talking about a carbon tax or even cap-and-trade systems. We are not objecting to any of these fiscal tools in the province. We are saying that the measure of efficacy of any of these fiscal measures has got to be whether they create Freidman’s eco-system of innovation? Do they get us to the answer because some of the cap-and-trade schemes that I’ve heard about don’t have that goal? To me that is sort of like fat guys paying skinny guys to eat their dessert. You have to put away the dessert. You have to find the answer. That’s the point we are making in Saskatchewan. That is where Saskatchewan is going to go. If the cap-and-trade continental system is inevitable, and we can agree on these relatively centralized federations on caps and prices and all of that stuff, we are going to be ready because we will have made the investment in Saskatchewan and in technology that actually gets us to the answer that makes us less dependent on coal for example in our province. In Saskatchewan, we seek that eco-system of innovation through the right tax policies. That’s the moon shot folks. I believe it with all my heart today. We want to be a force for good for the country in this effort. That’s part of the story that we came to Toronto with. We also want to share the prosperity and opportunities that we have in Saskatchewan with those who maybe currently unemployed or who may be losing their job in Ontario. This is a strength of this country that we love. One region can be strong when perhaps another is not as strong as it has been and can provide opportunity for others. My Canada, ladies and gentlemen, is a place where an eco-system of innovation is one of the positive descriptors of national identity. We live in a country whose nationality and patriotism to the extent it exists is too often defined insecurely by the things that we are not. And all my friends love that “I am Canadian” rant commercial. It was pretty clever, but if you listened to it long enough it became kind of frustrating. It drew identity for the country and pride in the country from a long list of negatives—we don’t do that; at least we’re not like this. I am not being critical here. That’s really part of our historical DNA. For those of you who had the chance to read Richard Gynn’s recent biography on John A. Macdonald, “The Man Who Made Us,” you will know that this is just the latest reminder that the country was founded, bound together in union, by as many negative and preventative incentives as positive and enabling ones. But today, notwithstanding our history, think of what binds us together in a positive way. Consider the huge resource potential of our country when the world is still looking for those resources. Consider the geographic diversity and the natural beauty. Consider the relative strength of our economy. Consider the federation itself, which is stronger than ever. The federation which has now more a have capacity than a have-not capacity. In 2008 there is simply too much grandeur, too much opportunity for Canadians to leave. Too much strength in our federation to not tempt and tease the next great moment of fate in our country’s history. I believe that one of those moments, at least, can be found in our desire and the world’s desire to have cleaner energy and how our place on the planet can offer that energy, that cleaner energy. That is our vision in Saskatchewan. That is the golden moment of opportunity that we are working hard to seize. When I get home on Wednesday night and walk through the door, Meg is right. I am not going to be the premier, I am going to be her dad, and Colter’s dad and Faith’s dad and someone’s grandpa some day. And really that’s what’s at stake. That’s what I think motivates all of us in what we do. It motivates our new government in Saskatchewan to leave a place that is debt-free, cleaner and stronger than it ever has been economically. That’s good for Saskatchewan but it’s great for Canada. Thank you and God bless our country. The appreciation of the meeting was expressed by Lisa A. Baiton, Vice-President, Government Relations, Environics Communications Inc., and First Vice-President and President-Elect, The Empire Club of Canada.